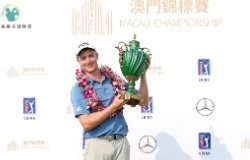 MACAU, CHINA—New Zealand’s Nick Voke eagled hole 17 on his way to a closing 5-under-66 and a two-stroke win at the RMB 1.5 million Macau Championship, becoming the PGA TOUR Series-China’s first back-to-back winner since China’s Zecheng “Marty” Dou achieved the feat in 2016. Playing in the penultimate group, the 23-year-old Voke picked up four shots in the last six holes at Caesars Golf Club to finish 15-under and secure the RMB 270,000 winner’s check, vaulting to third on the Order of Merit with RMB 602,000. American Trevor Sluman shot 67 to secure second at 13-under, while 21-year-old Chinese Yechun “Carl” Yuan posted a 70 to share third at 12-under alongside Americans Ryann Ree (70) and Jeffrey Kang (67), Tour debutant Luke Kwon of Korea (67) and Japan’s Yuwa Kosaihira (71). England’s Callum Tarren, second on the Order of Merit, carded a 68 to share eighth with India’s Rigel Fernandes, who closed with a 65 in his first Tour event. Voke tied for fourth in his Tour debut at the Suzhou Open in early September and won the Qinhuangdao Championship the following week, before finishing third at an Asian Tour event in Korea. He then practiced in Thailand for a week before coming to Macau, where he continued his remarkable recent run. The Kiwi started the final day three shots behind co-leaders Joseph Winslow and Todd Baek, and shot three birdies and two pars on the front nine, before moving up the gears on the closing holes with birdies on 13 and 15, and a stunning eagle on 17. “It was a big day out there. On the front nine, I didn’t quite have it. I was hitting some below-average approach shots. Fortunately, I hit it really close on No. 9 and made the turn at one-under, and I really wanted to get some momentum on the back nine,” said Voke, who was tied for the lead before his eagle gave him a two-stroke buffer. The methodical Voke, who is 17th on this year’s PGA Tour of Australasia Order of Merit, credits his current form to improving both his driving and putting from 5-15 feet, and his strategic approach paid off in Macau. “I know what I need to do to play well. I know if I play this golf course 100 times, my scoring will be at its best if I play it a certain way, so I stuck to my strategy. I think I got a few lucky breaks and you need that to win, so it was good,” said Voke, who celebrated with compatriot Luke Toomey on the 18th green. Sluman, 25, was delighted after securing his highest finish in his first year on the Tour and moving to ninth on the Order of Merit. The American had two bogeys and three birdies on the front nine, before bagging three birdies in a row from hole 13. He then picked up his third bogey of the day on 17 before closing with a birdie and is now looking for a big finish in the final two events. “I managed to get it back to even-par after seven holes, then birdied nine. I then went on a little run on the back nine and made some birdies, so 4-under was a pretty nice way to finish,” said Sluman, who played golf at the University of Louisville. From the 2018 PGA TOUR Series-China Order of Merit, the top-five will earn status on next year’s Web.com Tour, top-10 players are exempt to the Final Stage of the Web.com Tour Qualifying Tournament and any player ranked 11-25 is exempt to the Second Qualifying Stage.